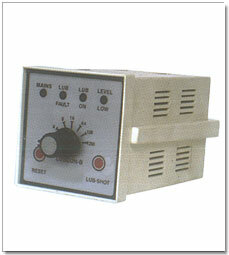 Electronic Controller can also be used to ON-OFF the Motorised units. This device maintain the lubrication cycle as well as monitors the operation of float Switch and Pressure switch at the same time. Electronic Controllers are suitable for units such as : LAU-03FPS, LAU-05 FPS, LAU-08 FPS & LDU-03 FPS However, cintactor is to be used in this case. Fault relay contacts can also be used for audio / Visual commands or for interlocking the machine in case of lubrication falure. In case arrangement for contactor is not possible, ECC-5 can be used. It is a complete solution with in built controller and contactor. Motor Relay On when power is turned On. by Pushing the Button Rest. Alub shot switch parallel to relay contacts provides extra lubrication as and when required. 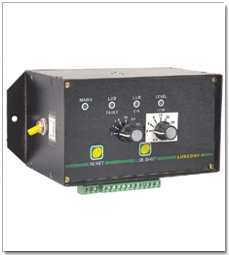 LED Lub fault flickers & fault relay is actuated in case pump fails to develop pressure even in 60 seconds. LED Low OIL Flickers when oil level in the reservoir goes below the Float Switch.